Wide-Angle landscape photography is a lot of fun. It enables you to capture the entire beauty of the grand vista revealing itself in front of you: the interesting foreground, the great leading middle ground and the beautiful backdrop with a nice sky above – it sounds pretty nice, doesn’t it? Photographing with a wide-angle lens isn’t necessarily that straightforward, though. It can be hard to create the visual impact you aim to when capturing so much information within one single frame. In fact, the images tend to quickly become too busy and the important subjects lose their significance. That shouldn’t discourage you to explore with a wide-angle lens, though; by following a few simple steps, you’ll quickly learn how to capture impressive images of the grand landscapes. The most common mistake I see with ultra wide-angle landscape photography is that the frame isn’t filled. Instead, there’s a lot of open space that doesn’t contribute to the overall image. The image above is a good example of when I’ve filled the frame. 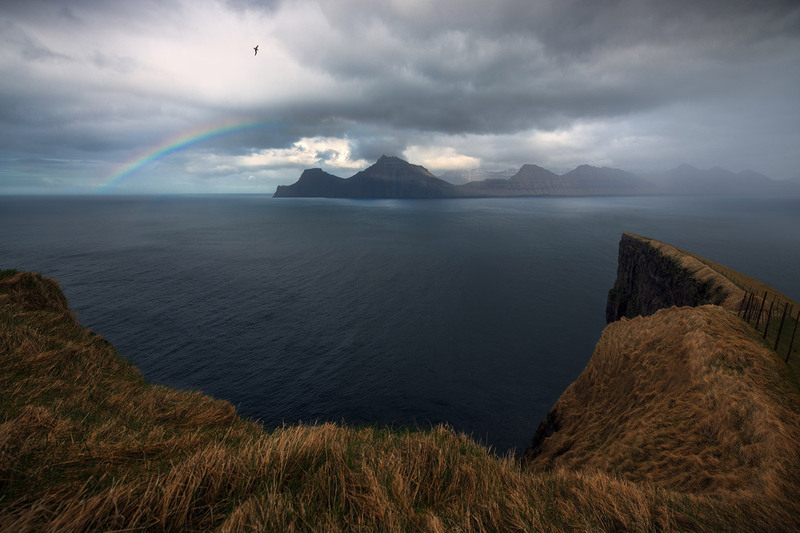 There’s not much empty and boring space within the image; the foreground works as a frame for the mountains, the ocean separates the two, there’s a rainbow filling the upper left and there’s a bird flying in the brighter area of the sky. In other words, the frame is filled and there’s no particular place where the eyes exit due to lack of interest.